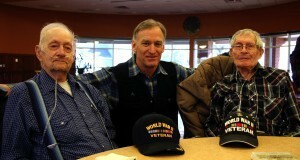 These spry young men were spotted in Gillette recently attending function honoring World War 2 veterans. Chet Haagensen on the left and Bill Prell on the right were some of the recipients in the 2014 Buffalo Stampede Charity Race last summer at the Durham Ranch. John Flocchini was happy to shake their hand and get a great picture. Thank you for your service! Click to read more!